The focus of the 2017 Flame conference highlighted several themes that are likely to dominate the evolution of business models, investment and market dynamics. Each May the European energy industry convenes in Amsterdam for the annual Flame gas conference. The 2016 conference was somewhat overshadowed by a focus on plunging commodity prices. In contrast, this year’s conference had a more constructive and forward looking perspective. This was driven by a focus on structural themes emerging from the early stages of a major transformation in the European energy industry. Decarbonisation, decentralisation and digitalisation. These three trends formed the backbone of conference discussions, reflecting their role in the energy industry transformation, being driven by both regulatory and commercial forces. Importantly, it appears that consensus is shifting towards this being an opportunity rather than a threat to the gas industry. The nature of the ‘three D’ trends also emphasises how the evolution of the European power and gas sectors is converging. To a large extent decarbonisation, decentralisation and digitalisation has ‘first impact’ on the power sector, driving a shifting focus towards payment for capacity rather than energy. But there are profound knock on implications for gas, as a provider of flexibility to the power sector, as a source of heat, as a substitute for oil in the petrochemical industry and possibly transport. These business model trends are consistent with the shift in regulatory policy towards the ‘three Ds’. But they also reflect a period of recovery from industry wide asset write-downs as market conditions have squeezed margins on conventional assets (e.g. thermal power and upstream & midstream gas assets). The dominance of vertically integrated utility business models is also being eroded. This is illustrated for example by the spin-off of Uniper from E.ON, utility divestment of E&P and generation assets and the transformation of Centrica towards a customer services company. 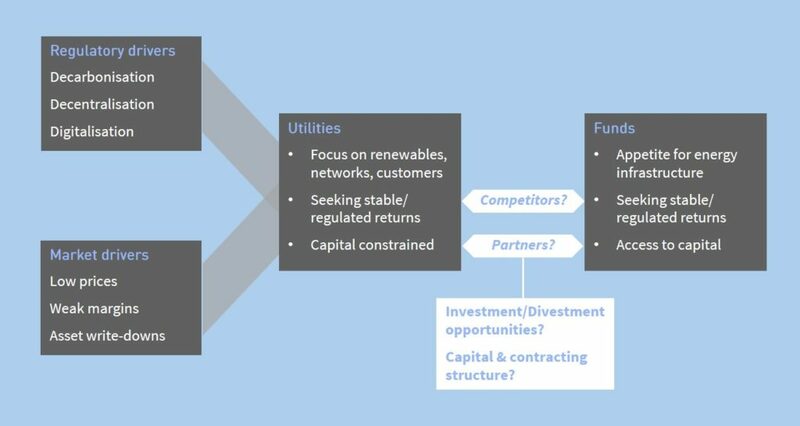 The traditional role of utilities is also being challenged by new entrants e.g. car & battery manufacturers and retail services companies such as Google and Amazon. Timera chaired a plenary panel on Investment and Divestment that focused on the evolving roles of utilities and funds. Discussion here highlighted how different pools of fund capital were driving asset investment. A greater willingness to take on market risk has seen private equity and sovereign wealth funds dominating investment in non-regulated assets (e.g. KKR’s acquisition of French CCGTs and ADIA backed TAQA’s investment in Bergermeer gas storage). Infrastructure funds on the other hand are being driven by a mandate to protect capital, underpinning an investment focus on regulated assets such as renewables and networks. The panel also discussed the interesting competitive tension between infrastructure funds and utilities, given a shared appetite for stable and regulated cashflows. This is being reflected in increasingly lean returns as highlighted by Dong and EnBW’s recent ‘zero subsidy’ wind project bids. Qatar – which in April fired a shot across the bows of LNG competitors as it lifted its production moratorium on the giant North field (we will shortly publish a specific article on the implications of this). There are interesting strategic dynamics around market share in the nearer term. If European hub prices continue to converge more closely with US Henry Hub, Russia may be able to temporarily displace some US exports by placing more gas at European hubs. But the more important question is how these players will interact to provide the new supply required in the 2020s and how this supply will be priced. There is a lack of clear industry consensus here and it highlights a key strategic issue for further attention. The emerging role of Europe as a key provider of LNG flexibility to the global LNG market was another important theme. This is a function of Europe’s hub price response mechanisms that allow efficient adjustments to both gas demand and supply (e.g. gas vs coal switching and flexible gas supply contract structures). Europe’s swing provider role also underpins its influence in setting global gas prices. Timera gave a Flame presentation on this topic setting out evidence on how European hubs drive marginal LNG price signals (summarised here by ICIS Heren). The increasing importance of US Henry Hub was also a key topic. As US export contracts ramp up, the influence of Henry Hub on LNG flow decisions will increase in significance. Convergence of European hubs with Henry Hub over the peak of the current supply glut could also see the US gas market temporarily driving global spot price signals. But for the moment that role sits with European hubs, which are also likely to dominate LNG price signals well into the 2020s.